How to Get Apple Music Free Forever? Solved! Apple Music is a streaming music platform that has emerged and popular in recent years. In the middle of last year, its paying subscribers has exceeded Spotify's in the United State for the first time. Using this wonderful streaming music service, everyone can access to large music library of over 50 million songs, Beat 1 live, Apple Music exclusives, Internet radio shows, hand-made playlists, etc. With the popularity of Apple Music, there are more and more Apple Music lovers focusing on finding a possible solution to get Apple Music for free and keep Apple Music songs forever as Apple Music tracks are protected by FairPlay DRM technology, which prevents users from playing music files after cancelling Apple Music subscription. Are you also the one who would like to get Apple Music free forever? Take it easy! In this article, we will introduce an effective workaround to make free Apple Music available. Different from other streaming music services, like Spotify and Google Play Music which offer users to listen to music, playlists and albums from their music platforms with no cost, Apple Music is a premium music streaming service. 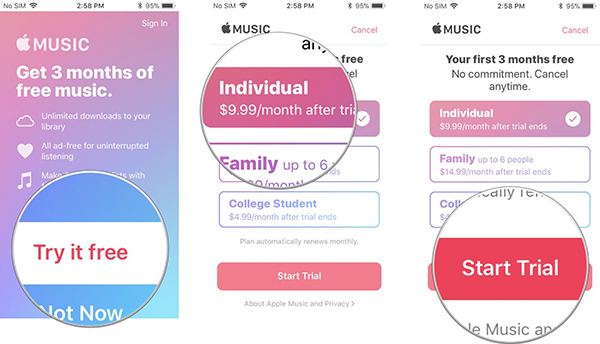 There are three types of Apple Music subscriptions, including $4.99 for students with student discount, $9.99 per month for individual as well as $14.99 every month for family (up to 6 members). But it doesn't mean that you need to pay for money for playing Apple Music files. Fortunately, it offers a three-month free trial period for all new subscribers before subscribing Apple Music plan. The Music app for Apple Music is available for iPhone, iPad or iPod Touch with the latest version of iOS and Android mobile devices. You can easily sing up the free trial subscription via Apple Music app on your iOS and Android mobile devices. For Mac and Windows users, you can get free-trial Apple Music plan on iTunes instead. Here, we will show you the detailed steps on how to get Apple Music free trial on iTunes. Step 1. Open iTunes on your Mac or PC and then click the 'For You' tab at the top of the iTunes window. Step 2. Select the target type of trail offer (for per person or family) and click it to get started. Step 3. Now, you will be required to enter your Apple ID account and password. If you don't have an existing Apple ID, please create a new one. Step 4. It's time to validate your payment info. You need to add a valid payment method, like store credit or credit card and then tap Join to start a trial. Step 5. Now, you can start to listen to music and playlists from Apple Music. Please make sure you have canceled the subscription before the 3-month free trial ends. Otherwise, it will be renewed automatically. With Apple Music free trail, you can free access to the whole Apple Music library. However, why more and more music lovers are eager to get free Apple Music 2019? The key reason could be FairPlay DRM protection. Because Apple Music are encrypted by DRM technology, you can't actually own the digital media files, which is different from songs you purchased from iTunes that you have the ownership. Since when your free-trail offer expired or you cancelled the subscription, you can no longer access to music library and all music tracks you downloaded before will automatically disappear in a second. Only in the case that you continue the subscription, you can play them as before. How to get free Apple Music for free forever to unlock these limitations? In fact, the only thing we need to do is to get rid of the constraints of DRM with a professional Apple Music DRM removal software. 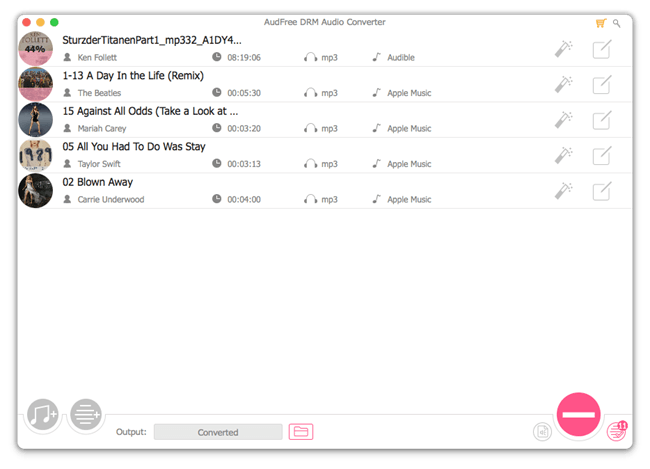 AudFree Apple Music Converter is such a perfect DRM removal tool, which is designed to remove DRM from Apple Music, iTunes audiobooks, Audible audiobooks, etc. and convert Apple Music to MP3, FLAC, WAV, AAC, M4A and M4B. With the assistance of this smart tool, you can get and keep Apple Music free forever. The operation process is easy. To get free Apple Music forever using the AudFree Apple Music Converter, you should start by downloading the converter and installing it on your computer. And then you can refer to the following three steps to finish it. With your Apple Music free trial, please download all favorite Apple Music songs to your local computer. And then you can launch AudFree software from your computer desktop and click the first 'Add Files' button to import Apple Music songs from iTunes library. Alternatively, you can directly drag and drop songs to AudFree's conversion window. Apple Music songs are encoded in M4P audio format, which is not fully compatible with non-Apple devices. 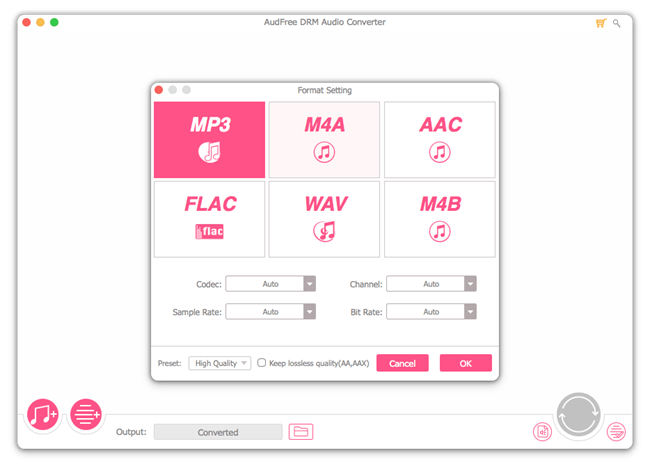 Fortunately, AudFree Apple Music Converter allows you to select output format as more compatible format, like MP3, FLAC, AAC, etc. by choosing the 'audio' icon. Just simply press the 'Convert' button at the right-bottom corner of the main interface and then this smart software will start to unlock DRM protection from Apple Music and convert Apple Music files to target audios. After conversion, you can locate all free Apple Music files and keep them forever even you cancelled the subscription.